Full size Brochure details are contained in a pdf file. 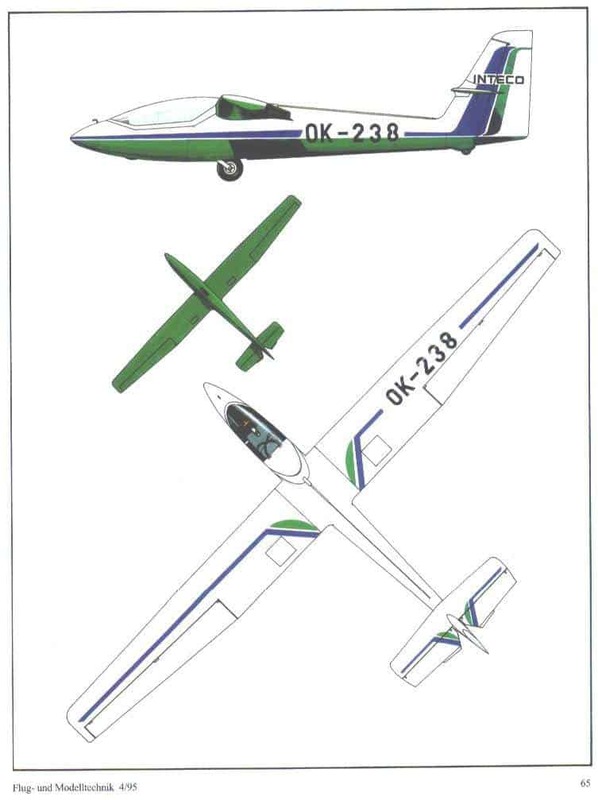 The design of the Czech aerobatic glider L-213A was from the late 1980s. A prototype flew in 1992. The flight test was started but never completed. Soon the project went quiet and the manufacturer INTECO disappeared from the scene. 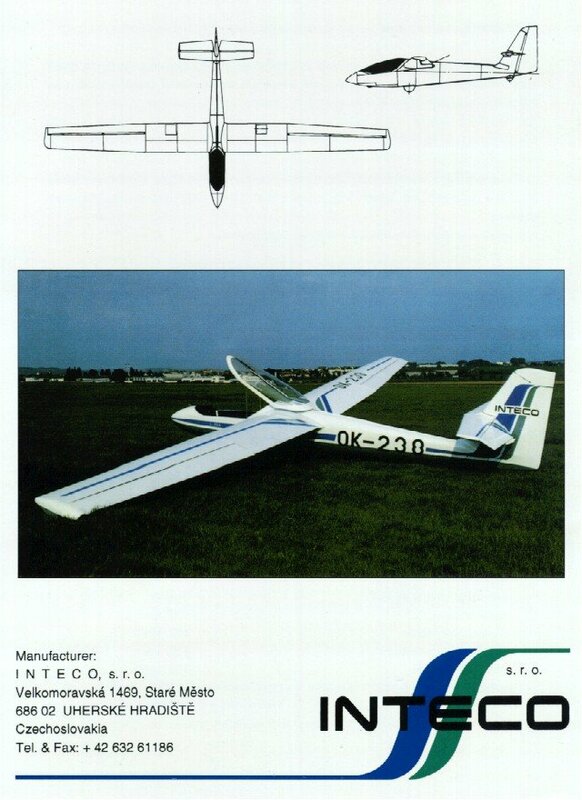 Today, only an old brochure and a model kit are reminders of r a Czech company with a quite interesting aircraft. 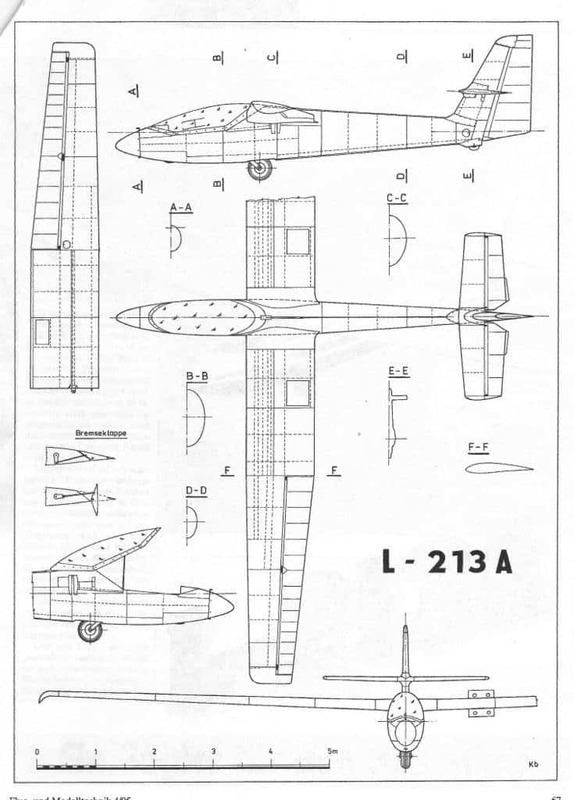 The L-213A was a metal construction similat to the Blanik (LET) family (L-13, L-23 and L-33), the type designation suggesting an affinity with the proven and globally extended Blanik. Not much is known about the technical details, only what is known in a rather meager prospectus. 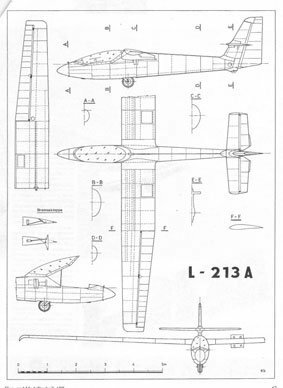 Thus, the L-213A was created in all-metal construction, only the control surfaces were covered with fabric. The wings were connected with three bolts onto the fuselage and tailplane was inserted from the front of the fin. The canopy opened towards the rear fuselage. The landing gear was only half retracted similar to the Blaniks, ie when retracted the wheel partially out. Lnding aids were narrow rotary brake flaps on the trailing edge. The large dimensions of the aileron extended over almost 60% of the span. There is no information about the airfoil and only incomplete data in the brochure. From the given specified sink rate of 1.2 m/s certainly no performance miracles were to be expected. The operating limits given are rather restrictive when compared to the Swift . One can only speculate about the reasons for the failure of the project. The most likely one is that the developers simply ran out of cash. 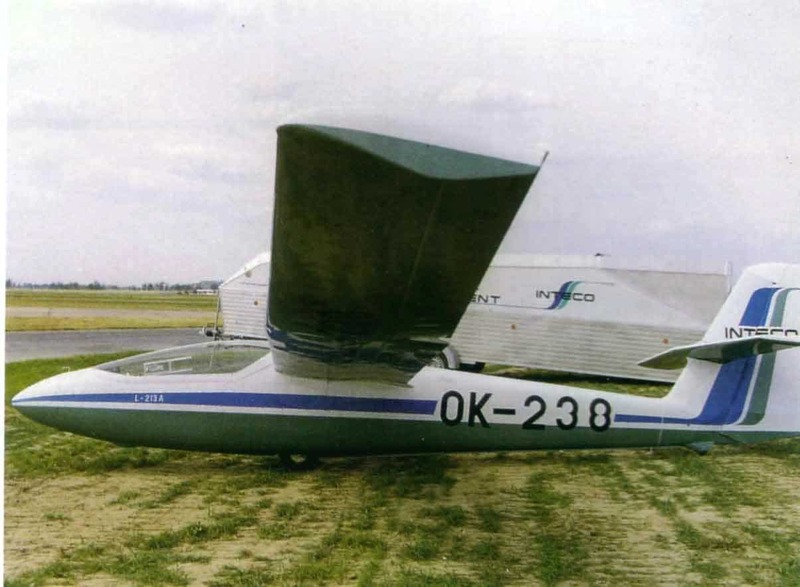 But besides that, the situation at the beginning of the 1990s was anything but favorable for the launch of a completely new aerobatic glider. The Poles had just created with the Swift an absolute winner. The Poles had constructed not an entirely new aircraft, but the best for 25 years, in principle an updated Kobuz 3. The Czechs had, just like the Romanians with their IAR 35 or Peter Celliers with its Celstar , only had to sort out the teething problems before the plane would have had a chance, but until then, the already tight market would have been occupied by the Swift.